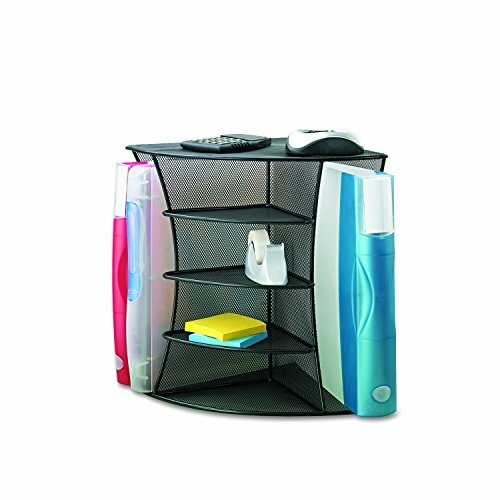 Onyx Mesh Corner Organizer offers a small footprint with big functionality. Featuring a sleek, professional design, it's manufactured with a stronger, thicker, commercial-grade steel for years of repetitive use. Four 2" high shelves hold smaller desk clutter while two 11" high sections organize your files, binders, projects, and folders. The powder coat finish helps resist chipping or scratching and the mesh design promotes air flow to reduce dust buildup. Ideal for mailrooms, cubicles, dorm rooms, offices, and kitchens. The Onyx Family includes a diverse collection of stylishly-designed steel mesh products, from desktop organizers to machine stands. Onyx makes it easy to create a sleek, professional, organized workspace. WORKSPACE EFFICIENCY. Onyx Mesh Corner Organizer fits perfectly in the most underused area of your desk-the corner. Four center shelves hold sticky notes and staplers while the two outer sections keep binders, folders, and notebooks within easy reach. STURDY CONSTRUCTION. Manufactured with durable, thick, commercial-grade steel, it's designed to last for years of heavy, repetitive commercial use. SLEEK STORAGE SOLUTION. Design works great on desks, personal workspaces, corporate mailrooms, cubicles, dorm rooms, home offices, family rooms and kitchen counters - anyplace that could benefit from stylish, space-saving organization. SMALL FOOTPRINT. Organizer measures 15"W x 11"D x 13"H for maximum storage in a small footprint. No assembly required.